Images courtesy Nathan Burkett Design. One of Australia’s leading landscape architects, Nathan Burkett, has won both the Melbourne’s Show Garden Gold Medal and the Mark Bence Construction Award at the Melbourne International Flower and Garden Show this week. The judges were impressed by Burkett’s architectural aesthetic and unique living centrepieces, which signalled a new direction for the discipline by spearheading a trend putting organic forms and natural structures back in the spotlight. Nathan’s design heralded a return to soft landscaping, which is less reliant on construction materials than the ‘hard landscaping’ style we have seen in recent years. Titled ‘Equilibrium’, the winning entry celebrates structure and symmetry, with Burkett’s signature clean sharp lines and a modernist approach to design. 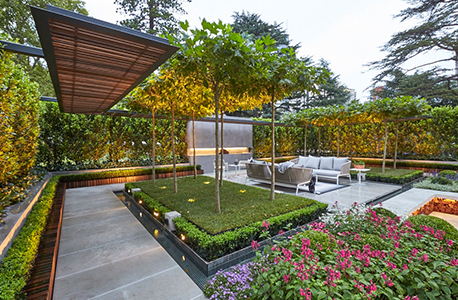 A wrap-around cantilevered arbor frames the the central garden while three metre tall Ficus Hillii hedging around the outer borders creating a sense of privacy and formality. Hands on as always, Burkett built a custom-designed fire pit himself. The garden may appear minimalist in essence but its cleverly disguised features are many, the seating area is paved with intricate stone work which continues along the garden’s base. 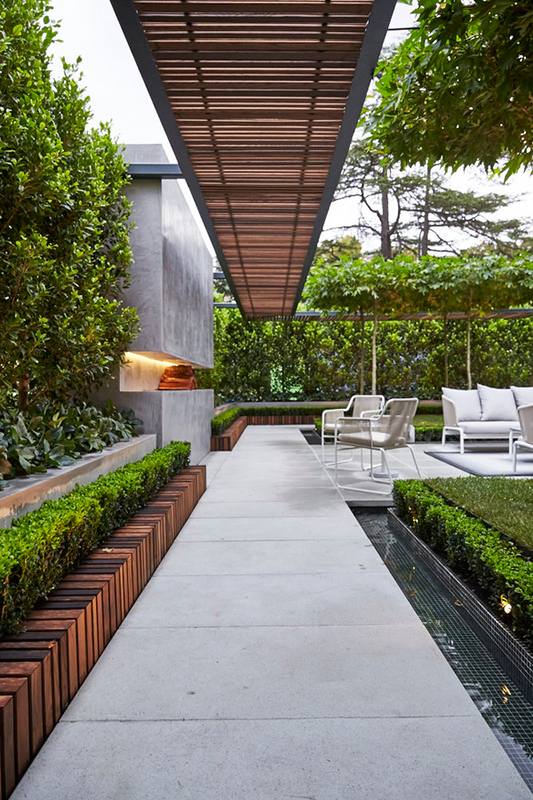 Interspersing soft lawns and a pond, subtly tiled with Italian glass, lie beneath this garden’s cool facade. Two mature Plane Trees form the centrepiece of the garden. Acting as living pergolas, their carefully trained branches mimicking an organic roof structure. At three meters tall and five years in the making, they have been cared for by Warner’s Nurseries leading up to this, their 15 minutes of plant fame. Burkett has trusted organic natural forms to act in place of man made constructs and the Plane Tree feature marks a significant return to utilising nature as an architectural – not just ornamental – centrepiece. In the designer’s own words Burkett states, “Many of the elements of the garden have been designed or grown specifically for this space so we have been overwhelmed with the public’s response so far… This garden has a lot of subtlety in the finer detail, you almost have to first step back to take it all in, and then step forward to appreciate the smaller touches,” he said. Nathan Burkett Design and many other practices are showcasing at the 2015 Melbourne International Flower and Garden Show, which is on now until this Sunday March 29 and is expected to attract over 110,000 plant enthusiasts.